The first step to recreating a Japanese-style bath at home is to clean your tub and to tidy up your space because you want your environment to be as relaxing as possible. As Decatrel points out, Japanese design is all about minimalism, so stash tubes of toothpaste and bottles of shampoo away. 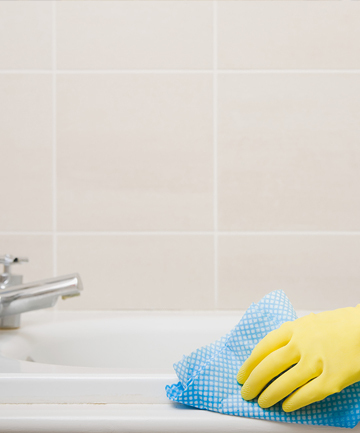 That being said, cleaning your bathroom isn't exactly the most soothing activity (in fact, it's a serious arm workout, if you ask me), but you can make things easier on yourself so that it isn't too stressful. Decatrel multitasks: She'll spritz cleaner into her tub while she's brushing her teeth, for example, and then she'll just wipe her tub before she's ready to take a bath.